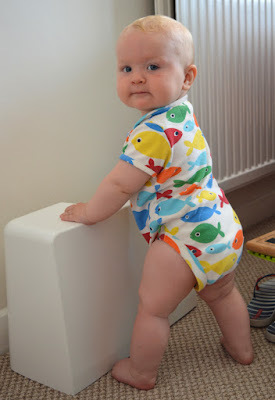 Err, for some reason it's taken me over nine months to blog about this creation. I'm not sure why: it took a freaking lot of work and it's seen lots of use, so it's definitely a success that I'm proud of. Maybe it's because it took me a while to get any half-decent 'modelled' shots, and then it kept getting bumped down the ' to blog about' list in favour of more recent projects. Anyway, today I'm going to do a bit of house-keeping and get this crazy project 'out there'. Like many a mistaken mother before me, I thought I could prevent my daughter from developing a princess obsession just by avoiding certain books and banning Disney our my home. FAIL. 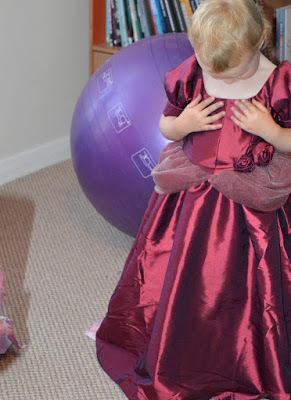 Like so many other little girls, Dolores fell in love with the idea of princesses at some point before her third birthday and desperately wanted to dress up like one. 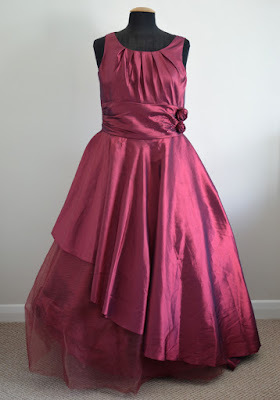 I didn't see the point in trying to ignore or avoid this desire, and instead of sourcing some mass-produced piece of tat that will look shonky after a few wears and washes, I though at least I could rustle up a dress that's unique and well-made. Rather than fork out a small fortune in the shimmery/frou-frou section of a fabric shop, I decided to find a pre-loved garment from which I could harvest the materials I would need. This bridesmaid's dress, found in a charity shop for £9.99, seemed to fit the bill nicely. After its dissection, the full skirt of this size 16 dress provided a lot of shot taffeta fabric, plus I thought the netting in the underskirt might come in handy. 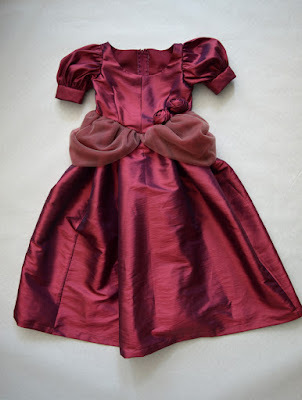 I chose a taffeta dress because I hoped the fabric would hold its shape without the need for extra layers of underskirt, which would be a pain to sew, and possibly annoying to wear. I also liked that there were lots of tiny bugle beads and two fabric roses around the waist that I also thought I might be able to reuse (I didn't end up using the beads in the remake). Oh, and its final plus-point was that it was on the pink spectrum, without being too pink. Ironically, in a bid to avoid Disney merchandise, I turned to a Disney sewing pattern: Simplicity 2563. 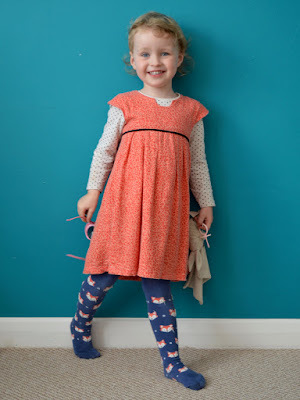 It was generously sent to me by the lovely Adey from The Sew Convert, along with some other patterns, when her daughter became older than the largest size. (You can see a whole load of sewing stuff I was generously donated when my little girl was tiny here.) I picked the pattern's design elements that were most suitable for my fabric, including those poofy side things from the 'Cinderella' dress that I figured would make the most of that double layered under-netting. I know I was making this dress for Dolores's third birthday, but I can't remember if I chose the size 3 or 4 (and I'm NOT prepared to wake Frankie up by going into my bedroom to hunt out the pattern to check!). Either way, I don't think the neckline should have resulted in such a deep scoop. 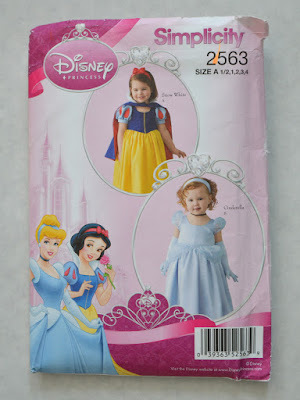 It ended up looking totally different to the dresses on the front of the pattern envelope, like those samples were made from a different pattern entirely. As you can see in the picture above, Dolores often wore it with a vest on underneath, which kind of spoilt the effect, but she didn't seem to notice or mind. 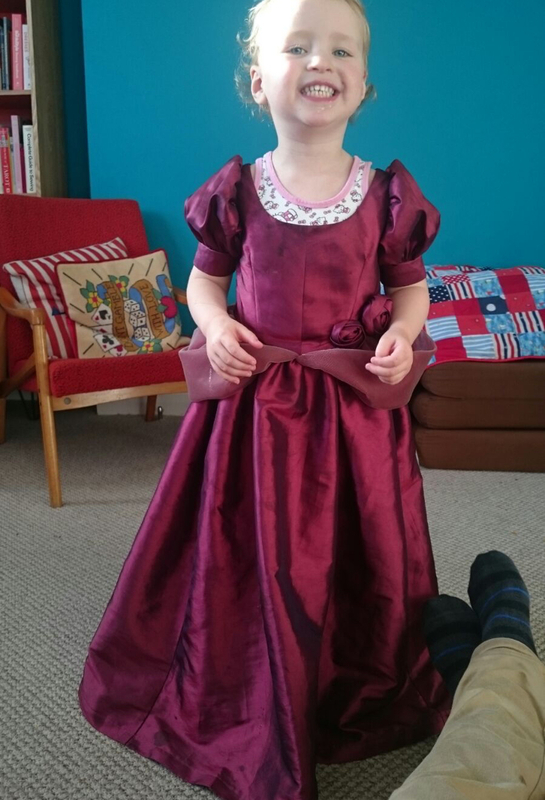 Now that she's almost four, the scoop thankfully doesn't look so inappropriately 'scoopy'. I decided not to bore you with interior shots, but you're going to have to trust me that this dress was A LOT of work. Well, it certainly felt a lot of work to this then-third-trimester preggers lady. Since its completion, I've gone back and shortened it to make it less of a trip hazard, plus I mended the hand-picked zip which came away during some particularly vigorous princessing. Aside from that, it's withstood a lot of wears, and of course a lot of washes. 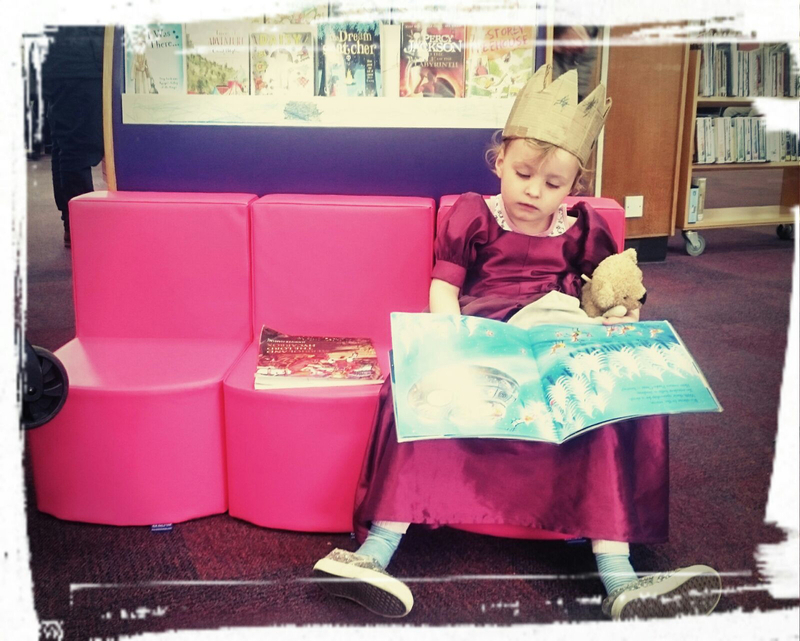 Over nine months later, Dolores still likes to wear it regularly, including to the library (see pic at top of post!). Sewing and small children. In many ways, they seem to be sworn enemies of one another. 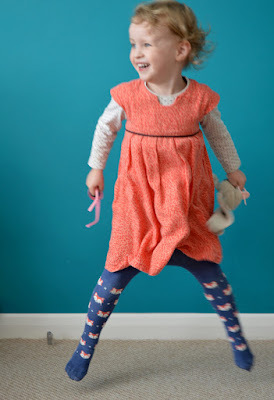 Finding the physical and mental space to sew, whilst being present and available for kids who depend on you for pretty much everything sounds like an impossible task, or at least a recipe for disappointment and frustration. 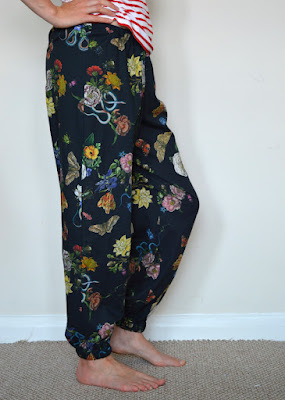 I often hear of women who used to sew before they had children, then stopped, and are trying to get back into it now that their children are older. I can totally understand the decision to not even bother trying to get any sewing done for the duration of your children's early childhoods. But for me, that's not an option, sewing is too big a part of my life. So today I want to talk about why and how I manage to sew whilst being a mum to two tiny peops. Somehow, I've become a stay-at-home-mum who does bits of paid work at the weekends. I never planned to be a SAHM. When Pat and I talked about how we saw our family operating before we had Dolores, we agreed to share the childcare and our freelance work endeavours 50/50, and to keep our child/children home with us rather than in childcare until they were about three years old. But the financial realities were such that two part-time freelance-whatever-you'd-call-what-we-do/did wasn't bringing in enough to live in this pricey part of a pricey country. So I ended up taking on the lion share of the childcare as Pat went out to work full-time, and things will probably stay this way until they are both at school. And the truth is, being a stay-at-home-mum is freaking hard, the hardest job I've ever, and will ever do, I have no doubt. 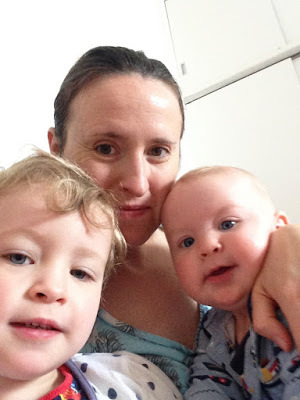 One of the things about being a SAHM (or a SAHD, or any other type of full-time carer), is that no matter how many playdates, playgroups, playgrounds, classes or activities you get involved in, there is A LOT of being stuck at home involved. What's more, you are ALWAYS on call. I find it can be incredibly claustrophobic, and as an escape I have sewing. So, sewing. I have to admit that my current relationship with sewing is bordering on compulsive. Working on sewing projects, having something to push forward with, has become even more important to me since having children than before. I'm not sure if the amount I think about (if not actively doing) sewing is healthy, but it is helping me get through this insanely intense part of motherhood so I can't see it changing for the foreseeable future. Sewing accesses a creative part of myself, a need to make stuff with my hands, that has always been part of who I am. And clothing has been the main way that I interpret and have a dialogue with society and popular culture since I was a teenager. But why has my need to sew amped up so much since becoming a mum? Partly, I think it's the desire to do something that doesn't get almost immediately undone (laundry, washing up, tidying etc.) but I'm also guessing that it's because I don't have much else to get my teeth into at the moment: my 'career' has somewhat stalled, I'm not developing any new classes to teach and I no longer organise the craft market I set up in 2010. And the other things I'm really inspired to do, like planning and going on trips and experimenting with growing food, are currently hampered by a lack of funds and any outside space. And then there's the final product. I get a lot of joy and pride from opening up my wardrobe and seeing that more than 90% has been made by me: that I have chosen how I wish to present myself to the world (which I then temper with the realities of my day-to-day life) and made it myself. Or to watch my kids running around having a crazy time, or contentedly chewing on a lego brick, whilst wearing something I made them. However, it's hard to square all this sewing that I'm doing (or planning to do) with my desire to live a vaguely sustainable life that does NOT include the constant acquisition of 'stuff'. So in an attempt to justify my out-put, I'm very careful to only work on garments and accessories for myself and my kids that will get used a lot, and I try to sew with my existing fabric stash or with secondhand textiles for a good proportion of my projects (which I know I could do better at). So how do I get the sewing get done with these small peops about? Mainly in my head. I'm mentally present when I'm with my kids and they want me to engage with them, but when I'm doing boring SAHM-related stuff like cleaning the kitchen, or breastfeeding in the middle of the night, I'll often be mulling over the next few steps of my current sewing project, or what I should use a certain piece of fabric for. So when they are in bed, or when one is at nursery and other is napping, I can ATTACK. I'm sure most people, including new(-ish) parents, will tell you that they are so much more productive with their spare time once it has become severely limited. But breaking it down further, I'd say that I find two types of chances for sewing. There's the longer stretches lasting an hour or two, like after they're in bed and the tidying up is done, or during a Frankie-nap on a Dolores-nursery day. (The annoying thing is that Frankie sleeps in our bedroom, which is where my sewing table also lives, so I have to remember to take everything that I'll need for the sewing sesh out of there and into the lounge before putting him down.) And then there's the micro-sewing opportunities. These are the teensy windows of time in which you can do something small to aid your project. Like the incredibly rare times that they are both playing and no one needs me, I might change over the threads on my overlocker. Or whilst I'm waiting for the potatoes to boil, I might pin a sleeve into an armhole. Often I'll do other SAHM-related activities in those micro-windows, but the thing is that there are always SAHM-related activities you could find to do, so sometimes I claim the windows for myself and my mental health instead. 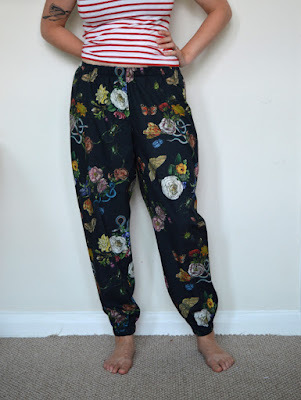 I've written this blog post like I undertake my sewing projects: in chunks of time here and there, so it's been on my mind for a while. And my conclusion is that I have not drawn a conclusion. I don't know if my current relationship with sewing is entirely positive, but it seems to be serving a necessary purpose. And I guess there could be worse things to be addicted to! I'd love to know your thoughts on your relationship to sewing, particularly through motherhood. Did you manage to maintain one? If so, any tips? How has it changed as your kids have got older? Did you ever find yourself getting a bit obsessed with sewing when you were going through a particularly tricky or intense stage of your life? So, having fallen hard for Made by Rae's Luna pants pattern, it'll be little surprise to learn that another pair has been whipped up already. But before I made my second pair, I was a good girl and went back and fixed the issues I had with the stress points on my anchor pair. Thanks everyone who left a comment making suggestions on how I could both fix that pair, and avoid the issue with future versions. Want to know which piece of advice I implemented? ALL OF IT!!! First, I cut narrow strips of fusible interfacing and applied them to both sides of the seam where the stress points had appeared. I then restitched the seams slightly inside the original row of stitching, which kind of 'ate up' the bits where the fabric was coming apart (unfortunately I couldn't let out the side seams to compensate for this slight reduction in fabric around the hips because of the in-seam pockets). Finally, I topstitched the rise seam allowance down to one side to reinforce the whole thing, and after a couple of wears, these steps seem to have fixed the issue with no further signs of stress so far.... But to err on the side of caution, I took another piece of advice and chose a size Medium, rather than the Small, for my next pair. Starting with the size Medium has obviously given a baggier silhouette to this second pair. I think I still prefer the look of the smaller, less-voluminous anchor pair, but I didn't want to wreck this amazing fabric if a repeat of the stress points occurred, so I'm trying to embrace this look. To avoid adding any more fullness around the hips, I didn't bother with the in-seam pockets this time. I know that omitting pockets would be close to blasphemy to some sewers/sewists! I like having pockets in my anchor pair, but the finish on this second pair definitely looks sleeker without. Plus, without them, this was a super-quick project. Aside from not bothering with the pockets, the only other pattern mod I made was to shorten the leg length by about 4cm. 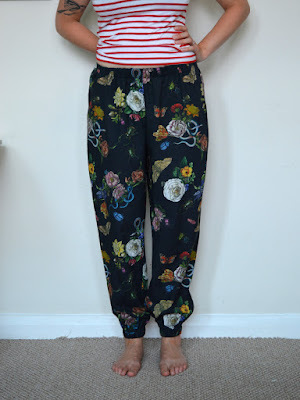 A couple of months ago Claire, Stevie and I organised a little South Coast sewing meetup. We visited the soon-to-be vacated storage space of Ditto fabrics, and Fabric Godmother's unit/treasure trove. We all came away from the latter with a goodie bag that included 2m of this A-MAZING Cobra corsage cotton lawn. I had been taken with this fabric at a previous Fabric Godmother open day, but had been focussing on purchases for specifics projects at that time. To have acquired some cost-and-therefore-guilt-free, was such a treat! An Instagram thread between the meetup attendees followed about what we planned to make with our pieces, but so far I only know of Claire's epically awesome kimono to have been realised from the fabric we were given. What I particularly love about this fabric is the fine detail of the printed illustrations. They make me think of Victorian tomes cataloging flora and fauna, the type that might exist at the Natural History museum. I'm actually wearing these trousers now and keep finding myself staring at the veins of a leaf or the scales on the snake. 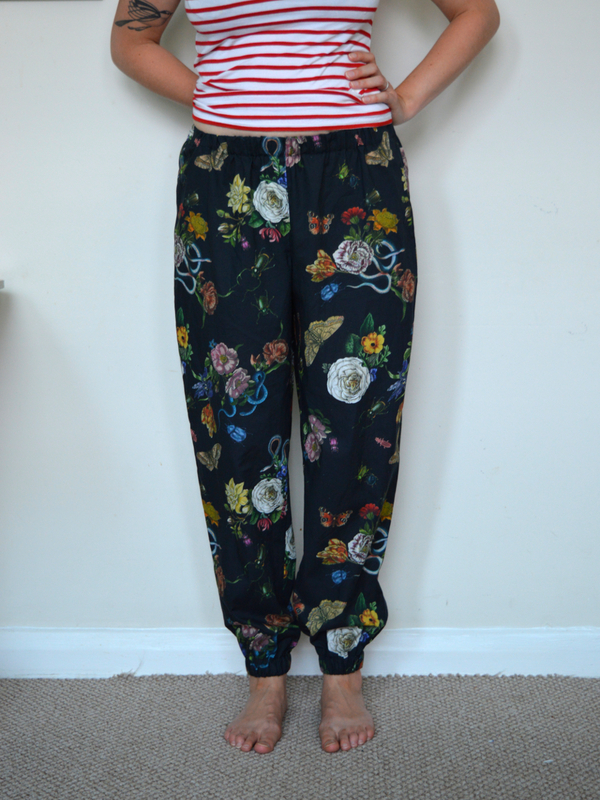 As for the fabric itself, it's pretty perfect for this trouser pattern. It's light-weight enough to feel airy when worn on a hot day and to hang well with this type of trouser style, but it's also opaque so no undies are on show. Plus, it's a natural fibre, yet doesn't seem to crease. Hurrah! If my anchor Lunas were a major style departure, then I'm taking the journey further still with these. I'm totally in love with them, but because they're not my usual look, they are pretty much wardrobe orphans. 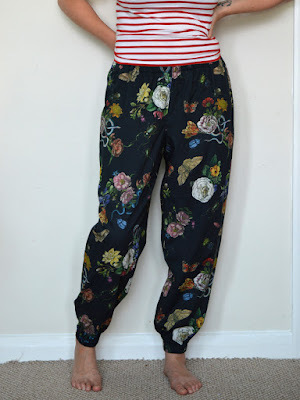 I have only one breastfeeding top that works with them, so I'm currently planning a couple of simple tops that will look good with these and other things in my wardrobe. Yep. 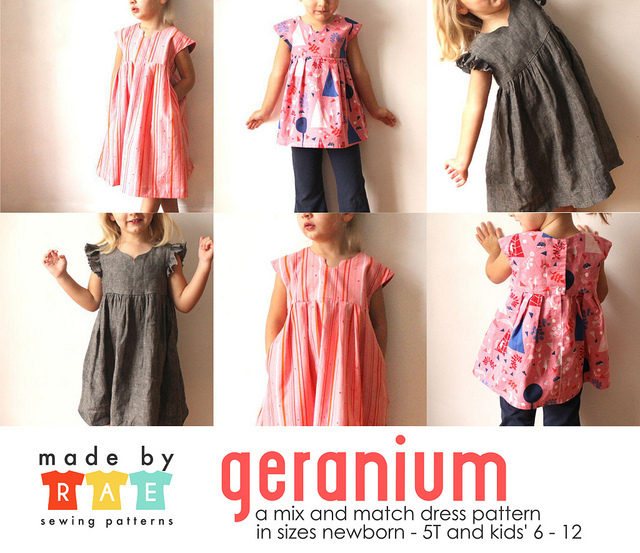 I can't lie, it's another Geranium dress. Even though I've already made about seven of these already, and have even taught other people to make them in a sewing class, this project still had some lessons to teach me. I've waxed lyrical about this pattern a number of times before, but I'll say it again: I really love all the different design options included. It makes the planning stage of your project even more fun than usual. For this version, I decided to try the faux-cap sleeve option for the first time, along with the U-shaped neckline cut out and the pleated skirt (minus the side seam pockets). I also added some black shop-bought piping in the bodice seam to add some interest, and to match the back buttons (you'll have to trust me on that because I forgot to photograph the back). This dress pattern isn't the quickest make ever, but it is super satisfying and you're left with such a classic, well-proportioned garment. When I was pregnant last year (was that really only a year ago?!) we chose to find out the gender at the 20 week scan, which I duly announced to the world. 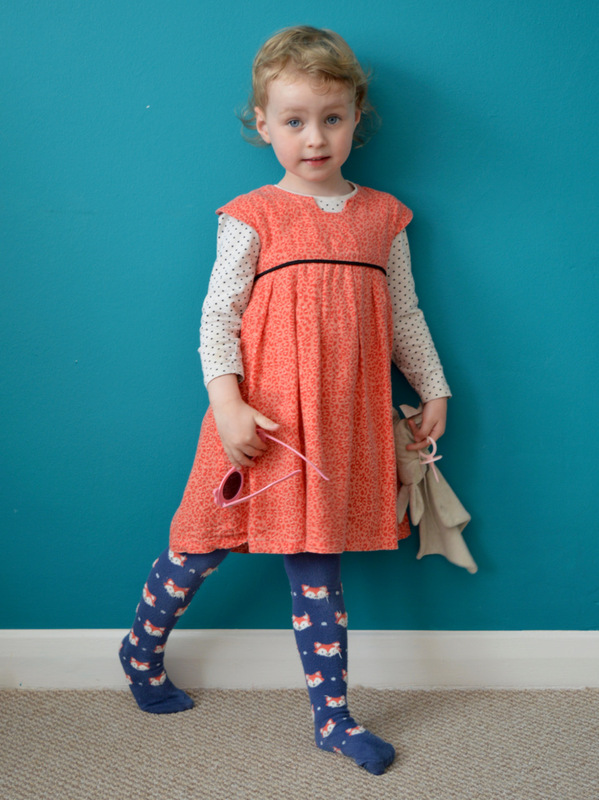 The incredibly lovely Josie from Fabric Godmother then sent me a bundle of fabric and a sewing pattern for making into boy clothes (a lot of the fabric became this little selection). Because she is so thoughtful, Josie also included a metre of this coral-y/orange leopard print twill (sadly no longer available) to make something for Dolores so she wouldn't be jealous! When I received it, it had a crispy handle which softened a bit after a pre-wash. I must have chosen the design elements based on my initial assessment of the fabric, thinking the stiffness would hold the U-shape and pleats nicely. Subsequent washes has softened the fabric further still, and revealed that it is actually very drape-y, and I've subsequently regretted those choices. Sad face. This dress has been worn approx. three hundred times since these pictures were taken. Dolores probably chooses so often because the fabric's weight and drape make it pleasing for twirling around in! Sadly, the U-shape at the neckline has stretched out a lot (despite the interfacing used around that area) and the pleats are even less defined. I regret choosing to include any kind of cut out, and for not making the gathered skirt instead. So my takeaway here is: choose what you're going to make from a piece fabric based on what it's like AFTER it's been washed, not BEFORE. My other lesson, that I think I probably already knew, is this: no matter how much faff piping is, including it is always the right decision.